Modernising air and missile defence is one of the US Army’s top six modernisation priorities, and one key element of that is rebuilding a frontline short-range air defence (SHORAD) capability that protects a manoeuvre force on operations from low-flying threats including UAVs. In June this year, Leonardo DRS was downselected to provide a mission equipment package for the service’s accelerated Initial Maneuver Short-Range Air Defense (IM-SHORAD) effort. This package includes a turret - developed by Moog - with a variety of kinetic effectors as well as onboard radar arrays. The US Marine Corps is also likely to leverage this effort for its own SHORAD requirements. 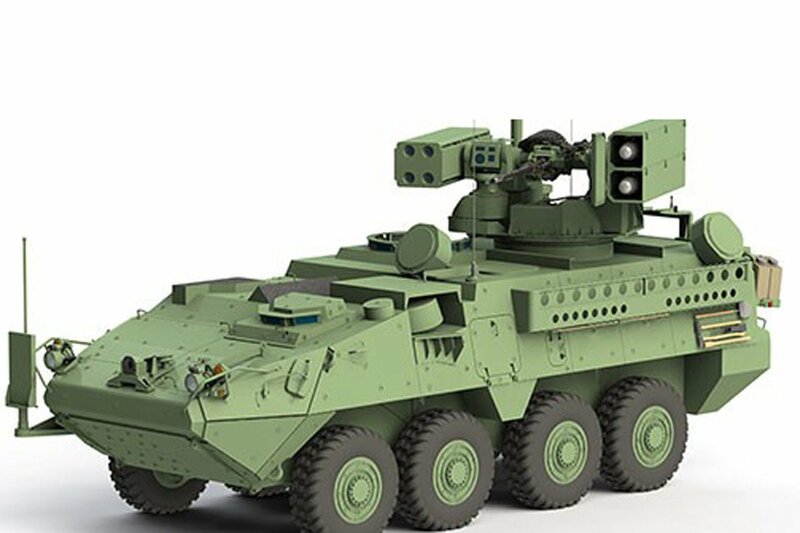 An industry source confirmed to Shephard that contracts were now in place, including with Stryker manufacturer General Dynamics Land Systems to integrate the turret, mission system package and radars. Up to nine prototypes of the new vehicle are expected to be complete by the spring of next year, followed by testing and, if successful, the start of serial production of over a hundred platforms by the end of 2019 or early 2020. Moog will showcase the IM-SHORAD turret solution at this year’s AUSA exhibition in Washington DC, known as the Reconfigurable Integrated-weapons Platform (RIwP). Moog boasts that the turret has more than 125 weapon configurations to meet a variety of emerging threats on the battlefield. The specific turret on display at AUSA 2018 will be equipped with a Northrop Grumman Innovation Systems M230LF 30mm chain gun, a 7.62mm coaxial machine gun, a Stinger four pack launcher and Hellfire four pack launcher. Electro-optic sensor technology will be provided by the Wescam (MX-GCS), which will allow stabilised long-range detection, recognition and identification along with target-tracking capabilities. The IM-SHORAD vehicle will also feature four distributed Multi-Mission Hemispheric Radar (MHR) arrays from Israeli manufacturer RADA, giving the platform the ability to detect a variety of targets including UAVs and rotary wing platforms.